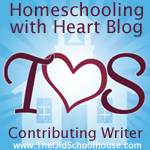 As the school year winds down, it’s a good time to reflect on the overall health of your homeschool. How are you doing? How are your kids doing? It’s also a good time to think about the decisions that you’ve made this year. How many of those decisions were made out of fear? It’s certainly not easy to admit that you’ve made decisions out of fear. Maybe you’re not even aware that you have. I challenge you to really contemplate what your real motivations were for each of the choices you made this year. Did you sign your son up for yet another activity because you were afraid that he would be socially outcasted if he didn’t participate? Did you insist that your daughter take an advanced class because you were afraid that she might fall behind her peers? Or, were you afraid that you might look bad in the eyes of other parents if your child was not involved in certain classes and activities? Did you make your son complete every practice exercise in his math book even when it was obvious that he understood the concepts because you were afraid of failure? You may be wondering why I included that second verse. Well, your decision making is training your children whether you realize it or not. Children are keen observers. If you regularly over-schedule your homeschool because you have a fear of not doing enough, your kids will learn that behavior. Do you want your children to grow up with that spirit of fear? Picture your children as adults. What do you want their lives to look like? It is time to let go of your fear and make decisions based on God’s direction. Think about your motivations. Take time for prayer and reflection before each decision. Sometimes, you will have to say “no” to a class or activity. It doesn’t matter what someone else is doing. God chose you to train your children. You have to make the tough decisions that are best for your family. My prayer is that as you look ahead to next year, you will let go of fear and have confidence in all of your decisions.